Fun facts, interesting tidbits, trivia - whatever you call little nuggets of information. We have a whole bunch of them right here. 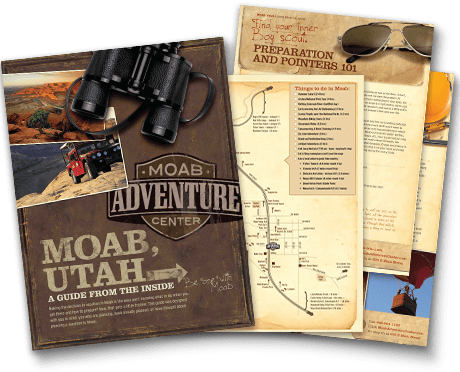 These might make a fun quiz around the dinner table before you take your exploration of Arches National Park. How Much Do You Know about Arches? How big is Arches National Park? 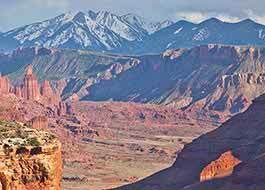 Arches National Park comprises 76,519 acres or 119 square miles. The park road to drive is about 18 miles to the end of the pavement at Devils Garden Trailhead and the campground. When did Arches become a National Park? In 1929 President Herbert Hoover created Arches National Monument, then in 1971 Congress designated Arches as a National Park under the Nixon administration. How many arches are in Arches National Park? There are more than 2000 natural sandstone arches inside Arches National Park. What is the biggest Arch in Arches National Park? Landscape Arch has the longest span of any arch in North America, 306 feet (93.3 meters), and is the fourth longest in the world. What is the most famous arch in the world and where is it? The most famous natural stone arch in the world - Delicate Arch! Known from photos, this arch has become iconic due to its freestanding shape. How much does the “balanced rock” weigh? 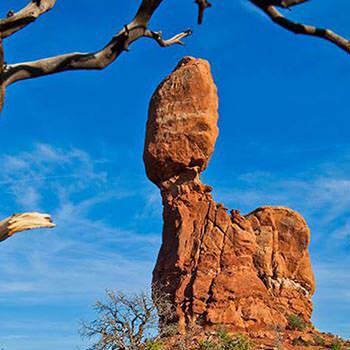 The enormous sandstone boulder atop Balanced Rock is presumed to weigh approximately 3,577 tons! What is the tallest opening to an Arch? You can find the tallest opening to an arch in The Windows Area of the park - Double Arch at 112 feet. What types of arch formations will I see in Arches National Park? Openings are formed by natural forces fracturing the rocks, and wind and water erosion.The types of arch formations you will see include cliff-wall arches, free-standing arches, pothole arches and natural bridges. Arches do fall, but in geologic time, not as often as one would guess. In 2008, Wall Arch in the Devil’s Garden fell. All arches and features in the park experience erosion and may some day fall. The park’s lowest elevation is 4,085 feet at the Visitor Center, and 5,653 feet at its highest peak by Elephant Butte in the Windows section. Has a bear ever visited Arches National Park? Yes, in 2013 a young black bear was spotted in the park by a few visitors. What does it take for an arch to be considered a true arch? An opening with 3 feet in any direction is considered an arch. Is a symbiotic relationship of algae and fungus that grows on the rock. Depending on its exposure to sun, rain and wind, it can take on different colors including grey, black, orange, yellow, purple and green. Is the soil in Arches really alive? The crust on the surface is a living community of microbiotic growth. This soil sustains the life in the desert. 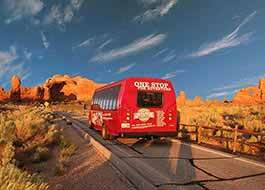 How many people visit Arches National Park? In 2016 over 1.5 million, compared to 833,000 ten years ago in 2006. Has anyone ever lived in Arches National Park? Not technically. Thousands of years of native culture (10,000 B.C. to 1200 A.D.) have passed through the area, leaving behind evidence of tool-making, fire pits of hunting camps, and rock art. The Navajo, Ute and Paiute Indian lived here from 1200’s to late 1800’s. More recently, ranching families lived at the Turnbow cabin in the then Arches National Monument. How many types of plant species are in Arches National Park? There are 745 species of flora in Arches National park. Hundreds of types of grasses, cacti, evergreens, deciduous trees, flowers, and bushes have adapted to surviving the harsh conditions in the park. How much rain does Arches National Park get? Precipitation varies in the high desert, but it can average up to one inch per month. How many types of birds are in Arches National Park? A lot! While not a birding hot-spot, there have been over 200 species recorded (including migrants). Are there endangered species in Arches National Park? The Southwest Willow flycatcher is an endangered bird, and there are over 20 plants and animals considered to be “Species of Special Concern,” like the Canyonlands Biscuitroot plant. Are there reptiles in Arches National Park? About 8 species of snakes and 12 species of lizards. The Plateau whiptail lizards frequents the trails, while the gopher snake (non-poisonous) and midget faded rattlesnake are less often seen. Are the there amphibians in Arches National Park? 8 species of frog, toad and salamander have been found inside Arches National Park. Who were the first people in Arches National Park? Human occupation is estimated back to 10,000 B.C. with the Desert Archaic people, through hunting groups of the ancestral puebloan and Fremont Indian, from 2000 B.C. to 1200’s. 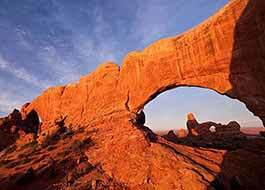 Who is the most famous person associated with Arches National Park? Possibly Indiana Jones, but in real life, Edward Abbey, a monument employee in the 1960’s. His diary, Desert Solitaire, depicts stories of The Monument and attracted generations to Arches National Park. How many movies were filmed in Arches National Park? Over 11 films have used a scene from Arches National Park. From iconic westerns such as Rio Conchos, to blockbusters such as Indiana Jones and the Last Crusade, and Thelma and Louise.